When I told my friends I was going to visit Iceland in winter, I got a few strange looks. I’m not shy in saying I hate the cold. But the idea of hiking on a glacier and possibly seeing the Northern Lights dancing in the sky lured me to brave the cold of an Icelandic winter - and it was absolutely worth it. Iceland offers spectacular scenery any time of year with its volcanoes, lava fields, hot springs and countless activities to suit all tastes. I’ve been to Iceland in summer but winter is in stark contrast and I’d highly recommend visiting in both seasons. I spent five days in Iceland but I wish I had more time – even with the freezing temperatures. 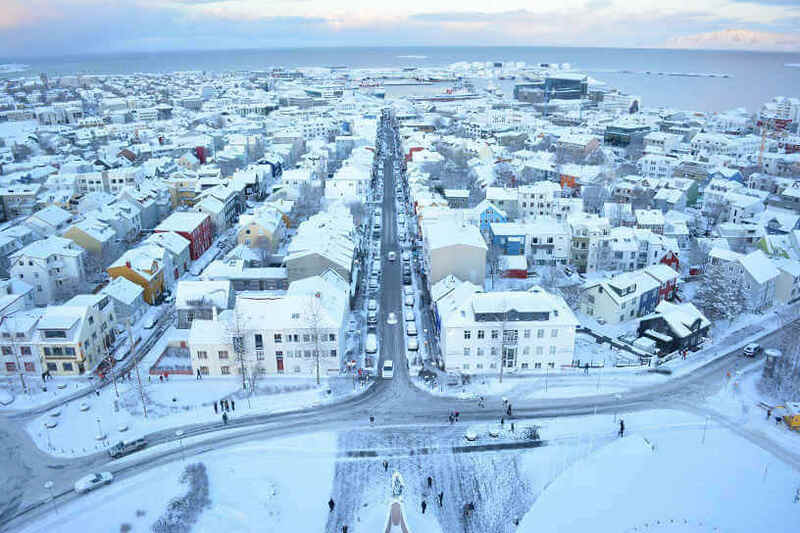 Iceland’s capital city Reykjavik can only be described as ‘magical’ after snowfall. 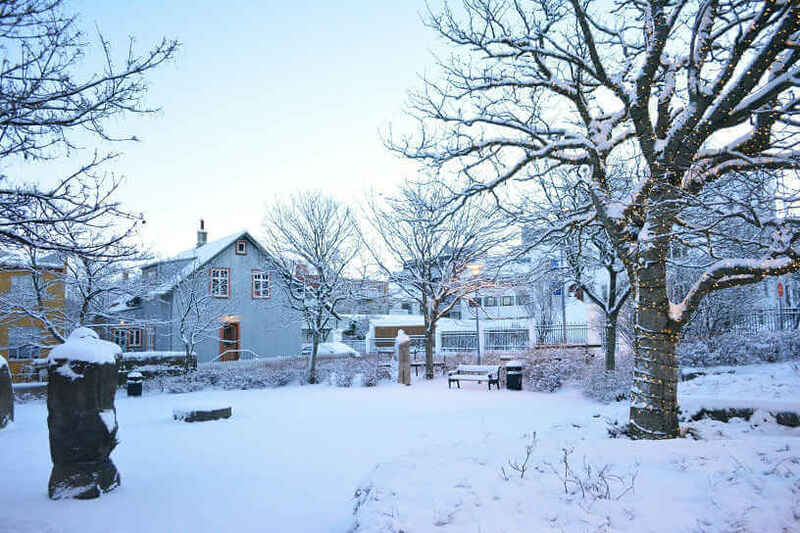 I was lucky enough to arrive in Reykjavik the morning after it had snowed – when the snow was fresh, thick, powdery and pristine white, and made that satisfying crunch sound as you walked through it. That morning, I simply wandered around Reykjavik taking in my beautiful surroundings and even experienced walking in my first snowfall (the excitement wore off in about five minutes though when I became cold and wet!). The streets of Reykjavik offer an eclectic mix of food, as well as a range of clothing and homewares stores and the centre has a fun atmosphere in the evenings. View of Reykjavik from the top of Hallgrímskirkja Church. The sun doesn’t completely rise until 11.30am during winter, but for around two hours before sunrise a blue tinged dawn sweeps above Iceland’s capital city and it is light enough to wander around and watch the sun come up. For sweeping views of Iceland, head up to the tower of the Hallgrímskirkja Church in the centre of Reykjavik. 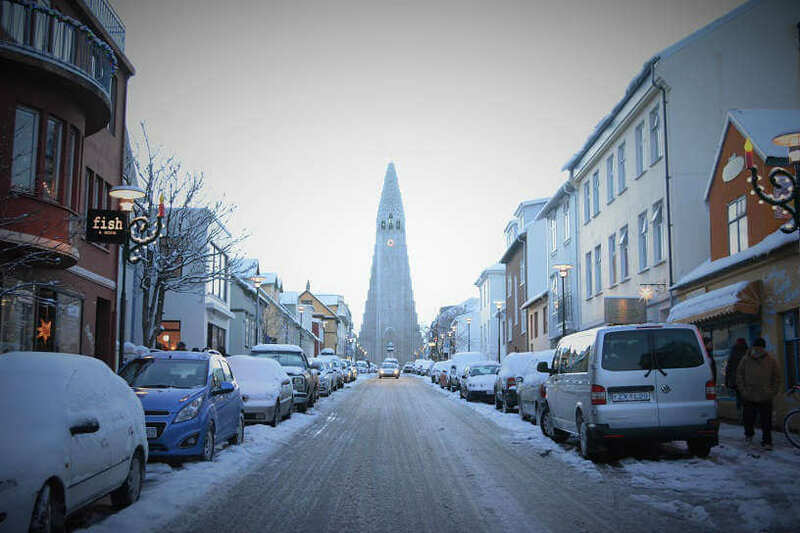 Walking through the streets of Reykjavik you can see Hallgrímskirkja Church. You can also take a walk down to the unique Opera House and check out the Sun Voyager ship sculpture on the promenade and the snow covered mountains beyond. Want to hop in a thermal bath, but don’t have the cash to splurge on the touristy Blue Lagoon? No problem, just head down to one of the many local swimming pools in Reykjavik – there are 17 of them across the city. Geothermal waters are in abundance in Iceland and you have your choice of swimming pools from the normal indoor set up, to outdoor hot tubs. On a recommendation from my hostel, I headed down to the Vesturbaejarlaug Swimming Pool and it’s certainly worth a visit. For $A9, you can take your pick between swimming laps in a heated pool or taking a dip in one of three outdoor spas – each one a slightly different temperature ranging between 36 and 40 degrees. Guest relaxing in one of the local swimming pools. 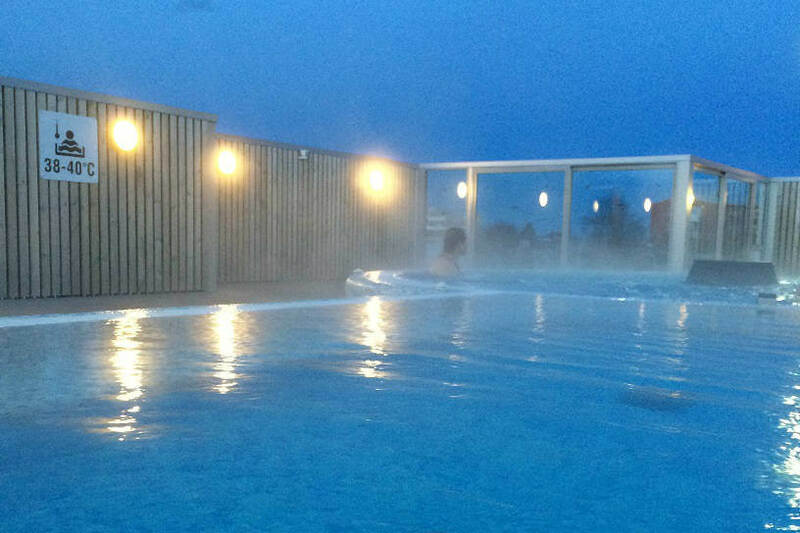 If I lived in Iceland, I’d probably come to these hot tubs a couple times a week. It was incredibly relaxing sitting in the hot tub watching the sun come up as the steam whirls around you in the frigid air. It was a chilly one degree when I went so be prepared to set a quick pace to and from the spas. But it was definitely worth the sprint in and out to be warmed by the thermal waters. The Blue Lagoon is worth seeing at least once but entry comes at a pricey $A64. You need to book ahead to visit the Blue Lagoon and select a time to enter. You can book online at www.bluelagoon.is The Blue Lagoon is located not far from the airport and Reykjavik Excursions offers transfers to take you to the lagoon to or from the airport. It is a perfect location to unwind and relax. Being Iceland's top attraction, it will not disappoint. Another thermal bathing spot is the Secret Lagoon – located about an hour’s drive from Reykjavik. Cost of entry is $A28. The waters are very warm here, ranging up to 45 degrees. The facility is also a more natural setting than the Blue Lagoon. I ran out of time in Iceland and barely scratched the surface of what’s on offer. One thing I do know is that I’m definitely coming back again one day soon. On my list to do next time is snorkelling in Icelands Silfra Fissure and visit the Langjökull Ice Cave. Both these tours include pick-up from Reykjavik. These tours fill up quick, so you’ll need to book in advance. The Silfra Lava Fissure is located in the Thingvellir National Park and was formed by a split in the Eurasian and North American tectonic plates due to earthquakes. The water is crystal clear making it great for diving and snorkelling. The catch is the water stays at a constant two degrees all year round. You are supplied with a wetsuit but it’s recommended to wear thermals underneath as some water will seep through. Despite the cold temperatures, all the locals I talked to recommended this tour saying it was one of the best things they had done. Other activities you might like to try include dog sledding, snowmobiling, and horse-riding near the lava fields. Unfortunately, during my winter trip to Iceland, conditions weren’t right for Northern Lights, but there are a number of operators offering Northern Lights hunts.The best time to go to Iceland for the Northern Lights is during September and April. Dog sledding is a once in a lifetime opportuntity and was an activity I wish I had the time to do. 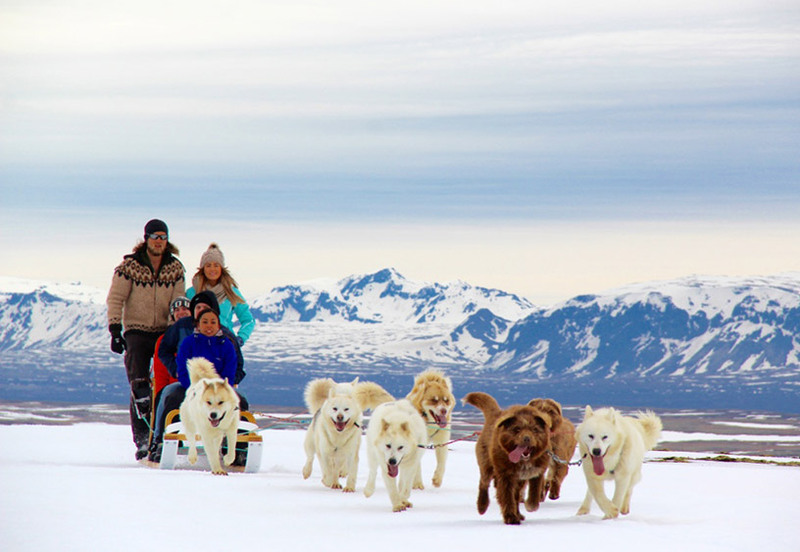 Dogsledding Iceland offers family friendly tours year round. Their expert guides will take you on a one hour tour with the huskies through the Icelandic landscape during which you will have the opportunity to interact and take photos with them. Sit back enjoy the ride while you learn about dogsledding and listen to stories about our athletes. After the ride guests can walk around the kennel to meet these majestic animals, one on one. The great part of Dog Sledding Iceland is that if you don't have time for a tour you can visit them for a guide led kennel tour and meet all of our dogs up close and personal. With 45 Greenlandic, Alaskan and Siberian Huskies these animals are waiting to meet you! Caution: If you get too close, you may get wet kisses and husky hugs. They also offer transfer service to/from a Golden Circle tour. Tours operate on dry land or snow weather permitting. Dogsledding Iceland operates from the South Coast of Iceland and it is the only dogsledding company in Iceland offering tours all year round. Discounted prices for children under 11 years old. Prices go from 19,900 ISK per person. It’s cold out, but don’t forget to pack your swimmers for the thermal baths. While thermal baths like the Blue Lagoon are fun to visit, the spas at local swimming pools are just as good and much cheaper. Bring layers and thermals to Iceland and a good jacket. Temperatures sit around -2 to 2 degrees most days but there’s often wind chill so it feels colder. Merino wool is great to use as a layer. Bring flat-soled boots to wear. Boots with a heel will be useless on the icy footpaths and you’ll be likely to fall. Many tours such as the Silfra Fissure snorkelling and dog sledding fill up fast so book ahead. Credit cards are accepted almost everywhere so if you’re only there for a short time, you probably won’t need to change money into Icelandic Kronor. 100 Icelandic Kronor equals about $A1. Lisa Owen is a pint-sized Australian following her dreams to travel to as many places as she can, and loves to share her photography, travel hacks, hiking adventures, and food discoveries along the way. At last count, she has travelled to more than 40 countries in between working in public relations and discovering hidden gems in Australia's great outdoors.